We’ve all been taught since we were kids that cats hate water. 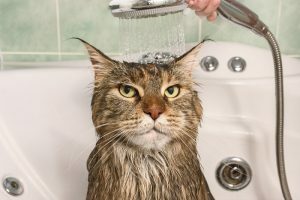 Whether it was from Saturday morning cartoons or real-life experience playing with felines, it’s become common knowledge to fear the wrath of any cat irritated by wet fur. Turns out that is not entirely true. There are, in fact, some cats that actually love the water. Most domestic breeds, though, have coats that absorb moisture—resulting in discomfort when they get wet. Whether your cat got caught up in something messy or is a little older and can’t clean themselves off that well anymore, you’ll eventually have to give your buddy a bath. If your cat loves bath time, consider yourself lucky. For the rest of us, here are some tips on how to make it through the ordeal with all your limbs intact and only the minimal amount of scratches or blood loss. The first key to a successful bath time is making sure you are prepared with everything you need before starting and ensuring everything is on hand before you get your cat wet. First, rubber gloves will not only help you keep a grip in the soapy water but will also protect your hands and arm from any playful (or panicked) scratches. Second, make sure you have the appropriate shampoo. Brands specifically made for cats or prescribed by your veterinarian are best. Third, have some cotton balls ready to clean your cat’s ears. This is a much better alternative to Q-tips since you never want to put objects inside your pet’s ear or ear canal unless specifically directed by your veterinarian (such as with ear infection medicine). Finally, a small cloth to clean your cat’s face and a large towel to dry them with is good. Optionally, have a friend nearby to record the experience for YouTube. Who knows, your cat’s bath time antics may make you go viral! The real reason, though, is that having a second pair of hands to help you out is always nice in case things get squirrely. Now that you have everything you need, it’s time to get started. If you can, use something smaller and elevated like a kitchen sink instead of the bathtub. This will make it easier on yourself so you don’t have to bend down to reach your cat. Having a smaller space to work with also prevents your cat from being able to run around and escape. Once you are set up, start by getting their body thoroughly wet with warm water. After they are damp, gently lather in the tear-free shampoo. While you are doing this, be extra careful to avoid splashing their face as this generally irritates them. Use the small cloth to gently wipe at their face instead. After Fluffy is all soaped up, make sure to rinse them off extremely thoroughly. If there is any soap residue left when you’re done, your cat may lick it off which could be hazardous to their health depending on how much soap they ingest. So, be sure to get every last sud! Congratulations! The worst part is done. Now, to dry them off as quickly and efficiently as possible, lay out the towel and set your cat on it. Then fold the towel around your cat (not unlike a burrito, or should I say a purrito) and gently rub them as dry as possible. For cats with long hair, you may need to brush out any tangles. If Fluffy is being extra mellow about the whole ordeal, you may be able to use a hair dryer but, for some cats, the noise will just irritate them after a bath. Once the whole ordeal is done, be sure to give your kitty an extra treat and lots of affirmation for bravely surviving the apocalyptic bath! For more tips on caring for your cat, book an appointment with Cypress Animal Clinic in Orange.